Sudha’s first award for the Season 2008. The Sangeetha Kala Nipuna. A flurry of activities at the entrance of The Mylapore Fine Arts Club on the evening of 13 December, 2008, was indeed a harbinger to the prestigious function. Honouring Sudha Ragunathan with the title of Sangeetha Kala Nipuna. Known for its long standing contribution to the city’s scene of art and culture, The Mylapore Fine Arts Club has played host to some of the most memorable programs by the most learned and highly regarded musicians. Thus, to have been nominated by this prestigious Organization for the title of Sangeetha Kala Nipuna was definitely a great honor. Loving and valuing her rasikas has always been Sudha’s strong trait and perseverance. She took care to ensure that her loved ones were with her during her moment of pride. And she levered in their appreciation and affection all through the evening! The momentous evening began with a prayer song by Deepika, Sudha Ragunathan’s disciple. The Sabha Secretary Mr. Venkatraman then welcomed the gathering and introduced the Guests of Honour. Shri Krishnaraja Vanavarayar, Chairman, Bharatiya Vidya Bhavan, Shri Nalli Kuppuswamy Chetty, Shri A Natarajan, Former Director, Door Darshan Kendra and Mr. Cleveland Sundaram (entrepreneur and the brain behind Cleveland Thygaraja Utsavam, USA). Dr. Nalli spoke a few words on the relevance of the occasion and on Sudha richly deserving the honor. Notable amongst the audience were Shri L.Sabaretnam (industrialist), Shri V.P. 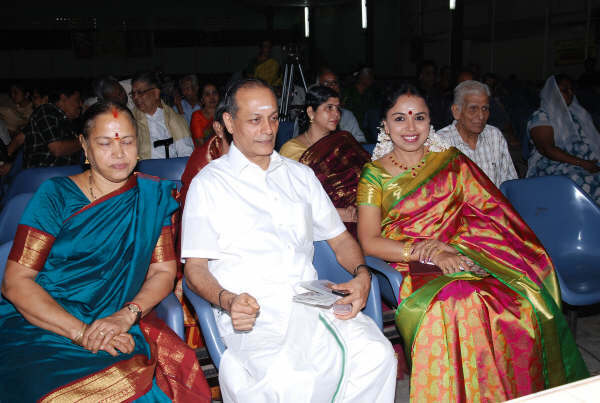 Dhananjayan ( Bharatanatyam Guru & exponent), Shri.Narasimhachari and Smt. Vasanthalakshmi (Kuchipudi Gurus & exponents), Shri Murali (Sri Krishna Sweets), Smt. 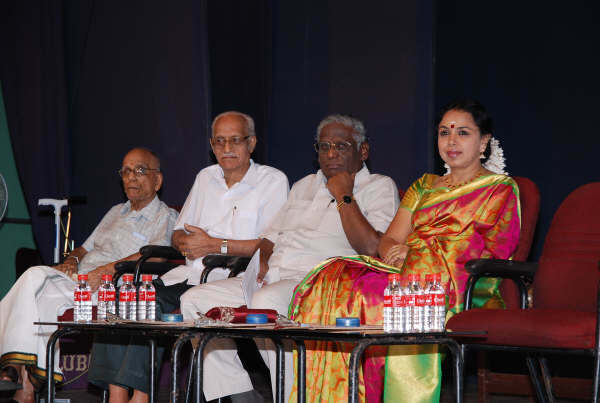 Manimekalai (litterateur) and Shri Nagai Mukundan (Upanyasakar) and the secretaries of various Sabhas and Cultural Organizations. In his very inspiring speech, Shri. Vanavarayar spoke very compassionately about the recent spate of terrorist attacks and the roles of each one of us, as responsible citizens of this nation, steeped in value and culture. He emphasized that it is finally only divine intervention that can give us respite and salvation from such dastardly acts….and what is noteworthy is that musicians are the healing influences while they wield their magic wand and mesmerise the afflicted with the divine power of music. How true….music indeed is a gift straight from above and those who possess it are all His representatives on earth, to bring in peace harmony and unity. An oasis in the desert called animosity. Being an ardent follower of Swami Vivekananda, he extolled Swamiji’s virtues and applied it to the relevance of daily life. He concluded his impacting speech with an observation that Sudha’s musical genius quite naturally makes all construe her as the next M.S and a noteworthy contender for the Bharat Ratna. Well, this emphatic statement did make many eyes moist&….those who loved Sudha and her music, those who took pride in her growth and recognition…. Those in the audience may also have caught Sudha wiping away a silent tear….! The show then moved on to the most important moment….Mr. Krishnaraj Vanavarayar honored Sudha with a shawl and handed over to her the coveted title of Sangeetha Kala Nipuna amidst a cheering audience, a battery of photographers and showers and blessings from above. It was indeed a charged atmosphere. The event also saw the grand release of Sudha’s musical DVD, VCD and audio titled Sukha Bhaavam by Amutham Music. The baton was handed over next to Shri A Natarajan who, in his short but powerful speech, brought to the forefront all of Sudha’s talent as a musician and values as a good human being. Following Mr. Natarajan, Mr. Cleveland Sundaram shared some moments in nostalgia of Dr. MLV and her magnanimity as a Guru, benevolence as a mother and her critical role in Sudha’s life and musical journey. He also recalled a very memorable rendition of Sudha’s in Shanmukhapriya at Coimbatore. It was now Sudha’s turn, and in reciprocation, Sudha dedicated all her accolades and awards at the feet of her revered Guru, Padmabhushan Dr. MLV. The tremor in her voice belied her composure…. as it was evident Sudha missed the Guru and the mother, which was what Dr. MLV was to her and continues to live in her heart for eternity. She also read out a ‘kavithai’ which was very well received by the audience. She next shared all her precious moments of pride with her dear rasikas, whom she viewed as extended family and how they are with her through thick and thin. She recalled fondly of her concerts at The Mylapore Fine Arts Club and the encouragement given to her in the early days of her career. Just while Sudha was still basking in glory with her very first award for the season, her daughter Malavika chose to surprise her mother and walked on to the stage with a big basket of Sudha’s favourite flowers. Well….the camera has caught the moment of pride in the mother’s face as her dear daughter walked in even more proud of her talented but humble mother. Sudha then gave away awards to the children who won in the competitions organized by the Club and then stepped down from the stage to be with the people who were so very dear to her…her rasikas, friends and family. Then continued a non stop photo session, hand shakes and hugs…there may have been a streak of tiredness in (m) any of the audience but certainly not on Sudha. She continued doing the rounds of obligations to be clicked, to sign autographs, to take in all the affection from young and old and the shower of blessings from the senior members. Amidst all the rejoicing and appreciation, the rasikas further endorsed their love and affection towards Sudha, her music and the cause she works for. Shri.Tharakaraman and Shri.Umashankar walked up to her and handed over donation cheques for Sudha’s Samudhaaya Foundation. Just before calling it a day, she watched the ensuing Bharatanatyam performance of Bala Devi Chandrashekar, and bid a final adieu to the crowd and left….to begin another day of music, meditation and mystique.